I am looking for a formula to calculate the balance on my savings account after x years whereby this savingsaccount has a fixed interest rate and my withdrawals increase each year (because of inflation) with a fixed rate. I am not looking for a multi-row spreadsheet solution. 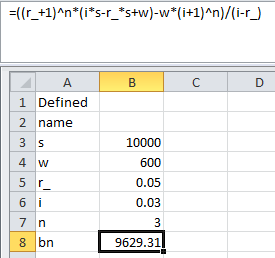 I need one cell (excel) formula. You could also use the above formula for monthly withdrawals (using monthly rates), but the withdrawals would increase throughout the year. The long-hand calculation confirms the formula. This formula works for quarterly withdrawals too. Just set y = 4. Not the answer you're looking for? Browse other questions tagged savings retirement-plan investment-income or ask your own question. Annuities and varying interest rates? What percent of minimum wage should I save from today,if I expect a certain percent of the then minimum wage,as income from corpus,after retirement? How can I figure out my Financial independence targets and years to FI? How do I calculate monthly compound interest in Google Sheets?